Meet your tour guide and begin your journey to Cairo. Once you arrive you will visit the Egyptian Museum, located in Tahrir Square in Cairo. The museum was moved here from its second home in the Giza Palace of 'Ismail Pasha'. There are 107 halls with the collection in chronological order. The ground floor holds the huge statues while the upper floors house smaller statues, jewels Tutankhamon treasures and the mummies. Your next stop of the day will be to Giza where you will view the pyramids and the Sphinx. The tallest of the pyramids reside at Giza. The region of Giza is one of the largest burial grounds in Egypt and it is unknown how large it actually is. The Fortress of Babylon is located at the boundary between the middle and lower Egypt. 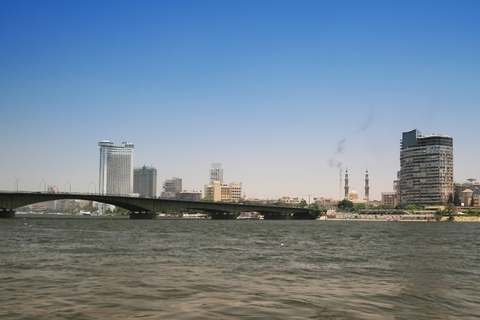 Tolls were paid at this location during it tenure and Cairo owes its life to this fortress. Located with the fortress are several churches including the Hanging Church and the Ben Ezra Synagogue. Day two begins at 9:00 AM with a visit to the Greco Roman Catacomb, a privately built tomb. These tombs represent the last existing major construction for the sake of the old Egyptian religion. The funerary motifs are pure ancient Egyptian, while the architects designed in the Greco-Roman style. A stop at the famous Alexandrian library, newly constructed to be in the style and object of the original ancient library. Next you will visit the Royal Gardens of El Montzha and the Salamlek palace. A photo stop at the ancient site of the light house and the Quibay fort. You will have lunch and free time in the local market before returning to your cruise ship. Remember to bring your camera. Note: tips, beverages in restaurants & hotels and the entrance to the solar boat/mummy room are not included in the price of the tour. The drive to Cairo is approximately three hours each way.